Another German sports car maker hopes to make a mark in the American market with the Yes! 3.2 Roadster. The Yes! 3.2 Roadster is reminiscent of the Porsche design but with more sharper lines. The Yes! 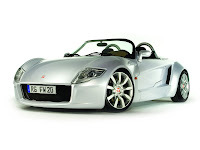 3.2 Roadster is a two-seater sports car with 3.2ltr V6 motor and 255 hp. This 890kg roadster can accelerate to 60 m/h in 4.8 seconds. If you want more power, there's the Yes! 3.2 Roadster Turbo with 355 hp which can launch its 930 kg body to an amazing 0-60mph in 3.8 seconds. There's no word as to when the Yes! 3.2 Roadster will be available but dealers will announced at the end of February.